By: Morgan Ohl on January 12, 2017. There is nothing more chic than a clean matte makeup finish. A matte makeup look is appealing, simple, clean, bold and brilliant! These are some simple steps to master the art of matte makeup. Follow along with me! The first and most important step for a clean matte look is hydrating and moisturizing. Your face should be cleansed and moisturized before applying makeup to enhance your face and give it a luminous effect. The next step to succeed in this chic look is to use a liquid illuminator to give an under glow. (Quick Tip: mixing your liquid illuminator with your foundation will eliminate a step and give the same effect to your face). After applying your foundation use a dust matte bronzer, this means no sparkle or shimmer. I recommend using a dust bronzer instead of a liquid, to try to limit the amount of liquid product. This makes it easier to blend. Apply this to the sides of your face, jawline, and nose to add a warm touch to your matte look, especially if you have fair skin. You could also apply this to your eye brows if you feel they need some color as well. To give your face that pop of color, while upholding your matte look, use a blush that has no shimmer or sparkle. Finally, to complete your base, use a matte translucent powder or spray to set your makeup, this will make it last longer throughout the day. Powder works best because the minerals actually set on your face as opposed to the spray that just sits until you take off your makeup. For your eye shadow, find a rich pigment with no shimmer to give a clean look. Do not forget to blend well, this is a very important step to completing your eye shadow. To top off your mastered look use a matte lipstick to give your lips life. If you follow these simple steps you will master you matte makeup look. 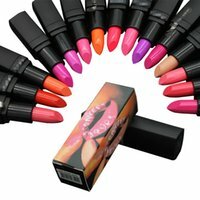 What are your favorite products when applying matte makeup? Comment below! Definitely a look worth trying. Thanks for the tips!